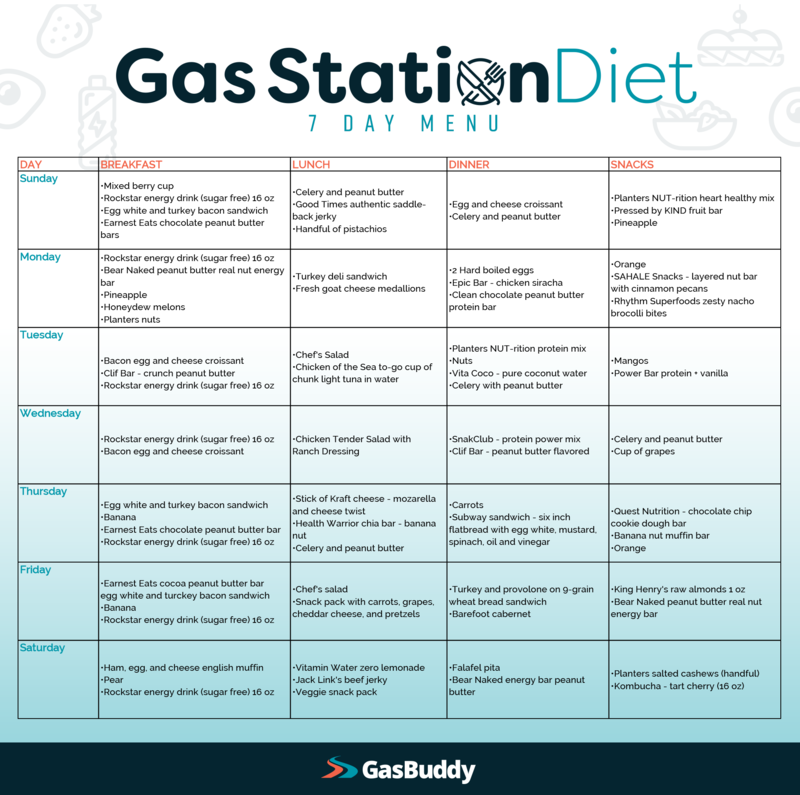 I Ate Gas Station Food for 30 Days. Here’s What I Learned. Before picture in 2011. After picture in 2016. Like many people, I’ve struggled with my weight. I finally lost the weight about five years ago. Determined to conquer it once and for all, I began tracking my calories. I consumed everything I could get my hands on about nutrition, food preparation and what to eat. My weight adjusted to reflect the new lifestyle I created and I soon discovered a passion for endurance sports. These days, I’m an active runner and cyclist. I also became tuned into the discussion about what it means to live a healthy life and I noticed something: we often speak of “eating out” as if it’s part of the problem—especially regarding weight gain. But is that true? Last year, I traveled around the country four to five days every week inspecting job sites for an engineering company. I flew out on Monday, returned on Thursday or Friday, and spent countless hours and many thousands of miles in rental cars. This meant that most my meals were consumed on-the-go in gas stations, fast food establishments and restaurants. According to the prevailing narrative about healthy living, I should’ve become less healthy since I was unable to prepare my own food. But that never happened. I felt great and I continued to see positive gains in my athletic performance. That’s when I realized that eating out isn’t the problem. What we eat is more important than where we get it, and healthy choices can be made whether we’re on-the-go or at home in the kitchen. In order to prove that eating out really can be healthy, I spent one month eating exclusively at gas stations. I chose gas station convenience stores because I wanted a challenge and, let’s face it, there’s perception that they’re a bastion of indulgent options like donuts, pizza, candy and soda. They certainly do sell those products—as do grocery stores—but they increasingly have other options, too. I traveled across nine states, visited more than 200 convenience stores. As I progressed through the experiment, I found fruit, vegetables, sparkling water, mixed nuts, healthy made-to-order options, salads and lower-calorie versions of indulgent items. What initially seemed like a challenge soon proved to be simple. Not only did I NOT gain weight but I actually LOST weight. I began the experiment at a healthy 163lbs and I ended one month later at 157lbs. Most importantly, I felt fantastic. I was almost sad to return to my normal routine. The convenience store industry has evolved. Today’s stores are larger, more upscale and offer higher-quality products than they did even 10 or 15 years ago. I think back to the stores that I visited in high school—local Kum & Go locations, the QuikTrip by the Iowa State Fairgrounds—and they’ve changed so much. Top convenience stores like Sheetz and Kwik Trip are partnering with the Partnership for a Healthier America to support healthful initiatives. For example, Sheetz committed to placing a minimum of ten healthier items near the registers in their new stores. Kwik Trip offers their employees a free piece of daily fruit. Sheetz offers an assortment of healthier options near their registers. Another c-store, QuikTrip sells fresh fruit, salads and many other healthful products. I often visit in the morning and purchase a breakfast bowl with eggs, sausage, and cheddar jack cheese—all of which are placed inside a car-friendly container. I even order through a touchscreen and watch as it’s prepared in front of me in their kitchen. I’m a big fan of the breakfast bowls at QuikTrip. As for Kum & Go, the new store designs are impressive. They have indoor seating, outdoor seating with space heaters and feature upscale restrooms. They have kitchens with made-to-order food service, beer growler filling stations and they sell freshly baked bread. I stopped by a new Kum & Go location near Des Moines, IA. The stores have evolved but the narrative about healthy living hasn’t. Fortunately, as I’ve demonstrated, healthful options do exist for those of us who are on-the-go or short on time. If you want something more indulgent, they have those options too—and that’s okay! What matters is that the convenient choice really can be the healthy choice. What convenience stores do you visit for healthy snacks? What do you purchase? Share your thoughts below.